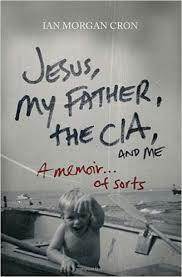 Books like Jesus, My Father, The CIA, and Me: A Memoir. . . of Sorts are the reason I love the Good Reads First Reads program so much. It’s unlikely I would have picked this up if I hadn’t received my free copy but it ended up being a surprisingly touching book. The synopsis at IndieBound reads: “An autobiography of Ian Morgan Cron, a clergyman in the Episcopal Church,” which is about as inaccurate as a synopsis can get while remaining technically accurate. Based on this description, the blurb on the back of the book and the title, I thought I was going to be reading about a CIA agent and his son’s religious journey. While both of those things made an appearance, they mainly served as background for the actual story, which revolved around the struggles of Mr. Cron’s childhood. His father was indeed in the CIA, but the more relevant fact was that his father was a drunk. And not the amusing, jovial kind of drunk. He was a pass out on the floor at noon on a Tuesday kind of drunk, get violent with his kids while he was drinking kind of drunk and altogether mostly a jerk drunk. Mr. Cron struggled with his father’s disease and made a wide variety of attempts to earn his father’s favor. First, he tried to get attention through acting out, then through becoming an overachiever. Thankfully he realized relatively early on that he was simply not on his father’s radar and there was nothing he could do. Some authors were like boxers. They took me down slow, landing one left hook after another one inch under my rib cage. Other writers were more precise, like surgeons, cutting through flesh and bone until I was laid bare to myself. That said, I did have a few issues with the way it was written. First, there seemed to be an awful lot of pop culture jokes / references thrown in that were kind of jarring. I read another review that referred to some of them as dated, which I didn’t find to be the case – but they were certainly references that will feel dated in 5 years. I felt that these references mostly fell a little flat and really just served to shorten the shelf life of the book. Based on the title of the book and what I’d read about it, I expected the spiritual journey to factor much more heavily into the story. Really though, the book basically noted that he attended a youth group in high school and become involved in the church later in life and then the last chapter got into some details about his beginnings with the church. There were a few other references here and there to growing up as a Catholic and his evolving feelings about faith but they were really few and far between. That said – I was actually really glad that it didn’t focus heavily on his religious journey. I am a non-believer myself but, having grown up in the Catholic church, I do have have some interest in learning about other people’s relationships to God and how they got there. I was glad that the religious aspect didn’t play a very large role at all but I do feel that the title misrepresented that a bit. If someone is looking for a read that focuses on religion, this is not going to be it. There should probably be some reference in the title to the strong focus on alcoholism because I think there’s an audience there who would really enjoy this book if they realized that it delved so deeply into the life of the child of an alcoholic. Overall I am definitely glad I read this book and I wouldn’t hesitate to recommend it to a friend. I found Cron to write with a kind, honest and insightful voice. This entry was posted in book reviews, memoir, non-fiction and tagged book review, cron, memoir, non-fiction. Bookmark the permalink.